What if you could help people get breakthroughs that they can’t get from any other form of coaching or therapy? Imagine the reputation you would develop if you could do that! And do you think people would pay a premium for that kind of help? You bet they would and… they do! Just imagine if you could help people quickly and completely get rid of anxiety, depression, nightmares, heartbreak, grief, resentments, stress, lower their blood pressure without drugs, be able to be much more focused and present, overcome traumas, stop addictive behaviors, even get rid of the chronic pain of fibromyalgia, trust and act on their intuition much more consistently, learn how to remove the barriers to making right decisions that lead to much greater success, and start to access and express the full potential of their inner greatness! By learning IGO you can do all of that and lots more!!! The vast majority of problems that people have are emotional. Everyone gets emotionally overwhelmed lots of times as a kid. Nobody likes it! This creates a deep pre-verbal conditioning to suppress and avoid intense emotions as much as possible. That sets you up for being really lousy at handling emotions. This happens to everyone. Inner Greatness Optimizing has discovered how to fix this problem and does it using a systematic process that consistently helps you to get one major breakthrough after another. People who have been doing traditional coaching or therapy are simply blown away by how quick and powerful IGO is. Once they learn it they don’t bother with anything else because there’s just nothing that comes close to the effectiveness of IGO. It’s incredibly satisfying and rewarding to help people in this way. 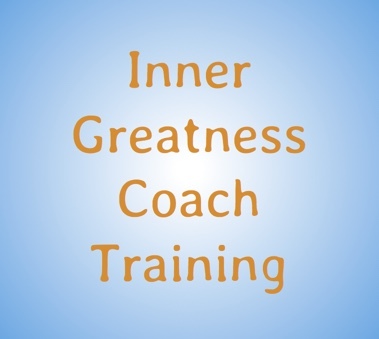 Becoming a Certified Inner Greatness Coach starts with the Inner Greatness Optimizing (IGO) basic 4-day Training. In this course you learn the unique and powerful basic tools of IGO. Whether you are experienced or new to coaching, this training will prepare you to start giving IGO sessions to others and getting amazing breakthroughs you can’t get by any other method. And another unique thing about IGO is that you can use it to get these kinds of breakthroughs for your most important client… yourself! The main goal of this training is to give you the knowledge and skills to be able to live and work from Pure Awareness all the time. The IGO protocol teaches you how to remove your inner barriers to experiencing your essential nature. in the 4-day basic training you will learn exactly how to overcome the inner barriers that have been limiting you and keeping you from having the life you are really meant to have. You’ll learn how to rapidly become a living example of emotional competence, trust your intuition more than you could ever have imagined was possible and get rid of the barriers to more consistently trusting and acting on your intuition which is what all successful people say is the primary key to success. You’ll learn how to do this for yourself and how to help others do this too! … And get really well paid for that!!! During the training you will get incredible breakthroughs for problems you’ve never been able to solve before. And you learn how to continue to get them for yourself and others. Our mission is to remove the pain of the world. And IGO has the techniques and technologies for being able to do that very effectively. If you’d like to help make that happen come join our world family of Certified Inner Greatness Coaches. If doing this calls to you, you’ll know it. And you’re going to find it the most rewarding and fulfilling decision you ever made in your life. Our training is available in person in different countries and on line via a series of live webinars. To find out more about how you can become a Certified Inner Greatness Coach send us an email using our Contact Us form. We’ll get with you for a video conferencing call to discuss how to best get you trained. We look forward to having your participation in this grand adventure.